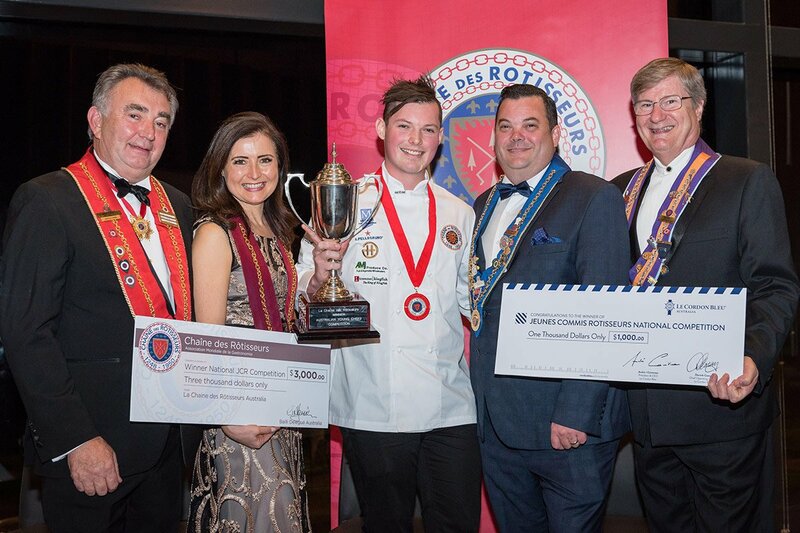 Le Cordon Bleu is proud to be a major sponsor of the Jeunes Chefs Rôtisseurs Competition 2017. International gastronomic association, La Chaîne des Rôtisseurs announced Chris Malone of Clarke’s in Perth, WA as winner of the 2017 National Final of the Bailliage’s Jeunes Chefs Rôtisseurs Competition and Australia’s finest young chef. The winner of the national competition was announced at a black tie awards dinner at the Adelaide Oval. The menu was prepared by Adelaide Oval Executive Chef Hamish Robertson, and Hill of Grace Restaurant Executive Manager, Chef and member, Dennis Leslie. The national competition was hosted in the Adelaide Oval kitchens by the Oval’s Executive Chef, Vice-Chargé de Missions, Hamish Robertson. The winner, Chris Malone received $4000 in prize money and an all-expenses paid trip to Frankfurt, Germany to represent the National Bailliage at the upcoming international final in September 2017. Le Cordon Bleu congratulates national winner Chris Malone, and all the talented competitors involved in 2017 National Final of the Bailliage’s Jeunes Chefs Rôtisseurs.